After being admitted to the Alberta Bar, the lure of a downtown job saw Mark take a job with Amoco Canada, working initially in its land contracts group and subsequently as a consultant to the contracts group at Home Oil. The conclusion of a Home Oil consulting agreement in 1993 resulted in an opportunity to work with a Calgary entrepreneur, providing securities law services to companies that were going public on the local stock exchange. Securities law is a specialized field with a great number of regulations. To do securities law well requires an understanding not just of those regulations but also of the ‘whole picture’ of a business’s environment and what it will take for that business to succeed. After a brief absence to establish a high-tech, start-up company to produce and market a product he invented and patented, Mark continued to focus on securities law. 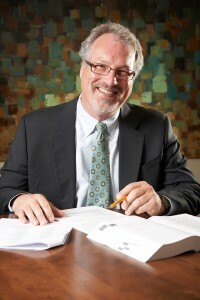 He practiced with both medium-sized and national law firms until June 2011. In July 2011, Mark joined McConnell MacInnes, Barristers & Solicitors, where he assumed responsibility for Larry Revitt’s corporate/commercial and banking law practice as Larry transitioned into retirement. Due to the growth in Mark’s law practice, Mark decided to start a new law firm, Fletcher Carter Barristers & Solicitors, located in southeast Calgary where he advises his clients on real estate, commercial and corporate law. Mark has continued his love affair with mechanical things. Over the years, he has built a house in Bragg Creek and an amphibious flying boat called a Seawind, in addition to inventing and patenting a wireless microphone. His abilities are not limited to mechanical things, however. When motivated and with spare time, Mark makes an amazing apple pie. Mark has been married to Ellen for nearly 25 years, and he and Ellen have a 16-year-old son. Corporate/Commercial Law (incorporations, purchase and sale of business, debt and equity financings, shareholder agreements, etc.